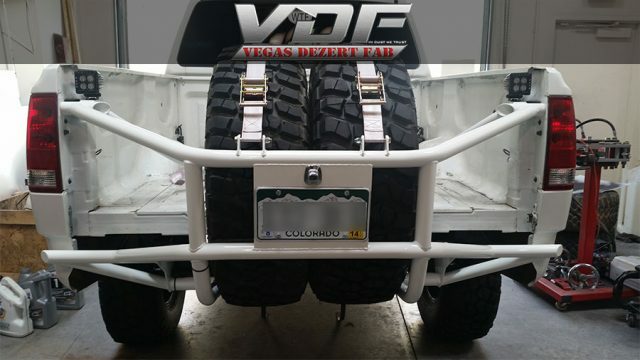 Last year we built a small bolt-on light bar for this client and when he returned home from working out of state he came back for us to build this rear prerunner bumper with a dual spare tire carrier. Along with the bumper we also mounted a pair of KC Hilites LED cubes to help him see when he is backing up. After the fabrication was done we sent it off to be powder coated. Our client was really happy with the way it turned out, he was almost speechless. So if you need a dual spare tire carrier for your Titan prerunner then contact us today. Tags: bumper, prerunner, spare tire, and titan.